KENNEDY SPACE CENTER, FL--The Endeavour astronauts took the day off Monday amid preparations for the afternoon departure of three space station crew members aboard a Russian Soyuz ferry craft to close out a 159-day stay in space. Shortly after wakeup late Sunday, shuttle commander Mark Kelly and astronaut Michael Fincke fielded questions from Mesa Verde Elementary School classmates of 9-year-old Christina Green, killed during an attempt to assassinate Kelly's wife, Gabrielle Giffords, in January. Asked what inspired him to become an astronaut, Kelly told the students "over the last four months, I've come to admire your classmate, Christina Green, very much, I've learned a lot about her." "When I was Christina's age is when Apollo astronauts were walking on the moon ... and I remember watching that on TV and thinking if I worked really hard in school and really, really focused and concentrated, maybe someday I would have the opportunity to fly in space. And I did work hard, and it did work out. But I would say it was those early Apollo astronauts, like Neil Armstrong and Gene Cernan and John Young, who inspired me." He concluded the question-and-answer session by promising to sign and return a school yearbook he carried into space aboard Endeavour. "Since my wife, Congresswoman Giffords, is from Tucson, Arizona, I spend a lot of time there," he said. "I'm a big fan of Tucson and the Arizona Wildcats. I didn't have a Mesa Elementary School shirt but what I do have is ... your yearbook, the Mesa Verde Mountain Lions 2010-2011 with me here in space, and I'll get a picture of this with the Earth in the background and hopefully I can bring it back and hand it over to your school." He opened the yearbook to a page honoring Christina Green and said "it's a very nice yearbook, Mike and I just signed it and I'll get my other crew members and the space station crew members to sign it and we'll send it back to you. "Again, it was really great to be with you at Mesa Verde today and I hope to see you soon," Kelly concluded. "So long." 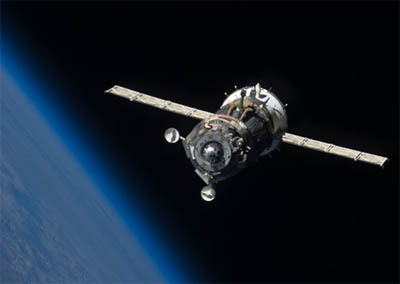 The shuttle astronauts are scheduled to go to bed at 12:26 p.m. EDT (GMT-4) and unless they get up early, they will miss the departure of Expedition 27 commander Dmitry Kondratyev, Italian astronaut Paolo Nespoli and NASA astronaut Catherine "Cady" Coleman aboard the Soyuz TMA-20 spacecraft. Hatch closure is planned for 2:21 p.m. followed by undocking at 5:35 p.m. Landing in Kazakhstan is expected at 10:26 p.m. In a departure from normal practice, Kondratyev plans to pause at a distance of about 600 feet while Nespoli, working in the Soyuz's forward habitation module, takes video and still pictures of the lab complex with the shuttle Endeavour attached. A few minutes later, the station will maneuver to present a side-on view showing the shuttle in profile. The pictures will be the first showing the shuttle-station complex from a distance, a last chance to capture a family portrait before the shuttle program comes to an end in July. But the Soyuz has no way to downlink the imagery and it will not be seen until a day or two after landing.